Sift Flour once, measure, add baking powder and soda and sift 3 times. Cream shortening, add sugar slowly and cream until light and fluffy. Melt chocolate and add to shortening mix along with egg yolks and mix well. Add flour 1/4C at a time alternating with milk and beat smooth each time before adding more. Mix in Vanilla and fold in beaten egg whites. 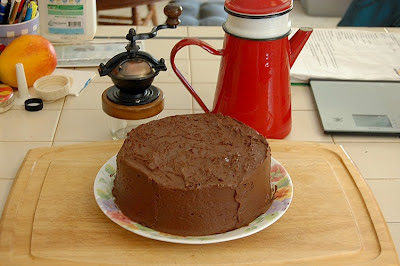 Line bottoms of 2 9" cake pans with parchment and grease sides with Spry Pan Coat Recipe*. Divide batter between both pans and bake in 350° oven for 30 mins until toothpick inserted in center comes out clean. Remove to rack to cool completely. Cream butter and add 1/2 of sugar gradually blending well after each addition. Add Vanilla, Salt and melted chocolate and mix well. Add remaining sugar alternating with milk. Add more milk 1T at a time to get perfect frosting consistency. Spread some frosting on top of first layer of cake then top with 2nd layer. Using the remaining frosting, spread evenly over top and sides and store cake in refrigerator until needed. I know some of you were just dieing to hear the story about the coffee pot and I won't disappoint. Strictly speaking it's not a coffee pot but a coffee biggin. It has the white filter with a water spreader that fits over the filter. To make coffee you put fine grind coffee in the filter and fit the water spreader over it then S L O W L Y drizzle boiling water over it. It takes quite awhile to make a pot but it's worth it. The coffee actually comes out double strength and needs to be diluted with hot water or hot milk (cafe au lait) before drinking. The Baker Chocolate Girl can suggest wonderful stuff like that all the time. Looks yummy, but I was wondering what is the texture of the cake like? And was the frosting really sweet? Yes, I do love that coffee pot!